Bamboo body pillow goes to great lengths to support you while you sleep. Whether you’re a side, back or stomach sleeper, the bamboo pillow conforms to your every curve for custom comfort from head to toe. Hypoallergenic, antimicrobial bamboo infused with aloe vera is softer than cotton and wicks away moisture to help keep you cool and dry. Removable zip cover is machine washable in cold water; tumble dry low heat. Spot clean pillow. 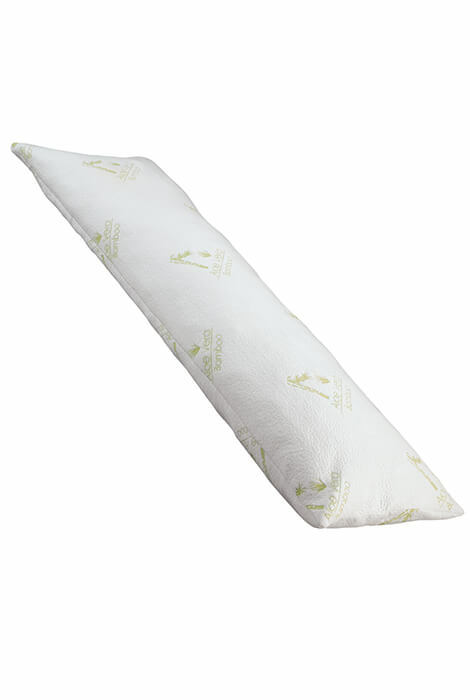 Hypoallergenic pillow measures 53” long x 16” wide. Shredded polyurethane foam cushion; 40% bamboo/60% polyester cover. Hypoallergenic, antimicrobial bamboo infused with aloe vera. 53” long x 16” wide.